At roughly 2:47 AM Pyongyang Time (6:17 PM GMT) on November 29, North Korea test fired a ballistic missile from the Sain-ni area. North Korea has since claimed that this launch was a new Hwasong-15 intercontinental ballistic missile (ICBM). Initial reports from South Korea’s Joint Chiefs of Staff indicated that the missile reached an apogee of about 4,500 km, and traveled 960 km downrange before impacting in the East Sea, within Japan’s Exclusive Economic Zone (EEZ). The total flight time was reportedly 53 minutes. Without additional flight data, photographs, or video of the launch, it is difficult to estimate the exact range of this new missile with complete certainty; however, preliminary calculations place the range from 13,000 km on the high-end with light to no payloads to 8,500 km with more standard 500 kg payloads. The previous ICBM model, the Hwasong-14, was tested twice in July. On July 28, it reached an altitude of approximately 3,725 km, landed 998 km from the launch site, and was aloft for 47 minutes, 12 seconds. The higher apogee and longer flight time suggest that the Hwasong-15 is similar to the one fired on July 28, but with a second stage powered by four small engines derived from the Soviet R-27 missile instead of just two. The payload mass for both tests is assumed to be the same, about 150 kg. However, the addition of two more small engines adds roughly 50 kg to the second stage mass. The reconfiguration makes sense, as the Hwasong-14 operated with an underpowered second stage. The low-thrust, long-burn time (230-240 seconds) engines used by the second stage tested in July suffered from significant gravity losses, reducing the missile’s range by several hundred kilometers. 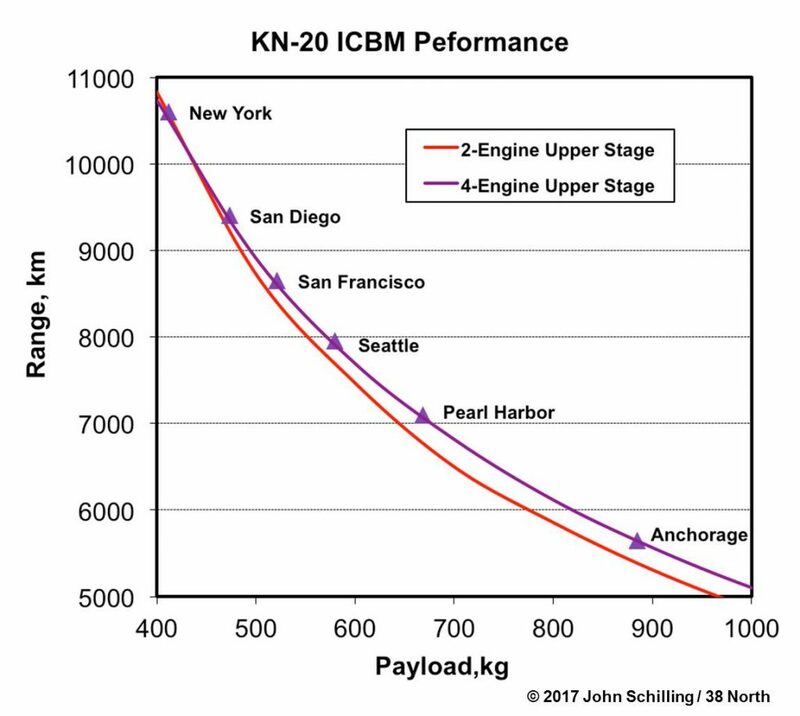 Though the Hwasong-15 remains underpowered when compared to ICBMs fielded by other nations, the addition of two engines doubled the second stage thrust (correspondingly halving the burn time) and allows the missile to reach a higher peak altitude, in this case about 4,500 km. If the Hwasong-15 launched on November 28 had been flown on a normal trajectory, they would have reached distances perhaps as far as 13,000 km, which is reasonably consistent with the findings posted by David Wright of the Union of Concerned Scientists. However, it is important to note—as Dr. Wright does in the last paragraph of his post—the Hwasong-14 and -15 missiles which were tested likely carried very small payloads, which exaggerate the range that can be achieved with a North Korean nuclear weapon. Indeed, the engineering model used for this analysis indicates the missiles were tested with a 150 kg payload. It is doubtful North Korea can fashion a nuclear weapon that weighs less than 100 kg. 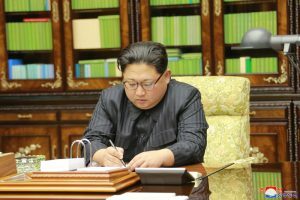 It is also unlikely that North Korea has enough experience developing, testing and validating the technologies needed to build a 50 kg re-entry vehicle capable of protecting the warhead during the high-temperature, high-stress environment experienced during descent through the atmosphere. As the figure below indicates, a Hwasong-14 or -15 fitted with a 500 kg payload (weapon plus re-entry vehicle mass) and flown on a standard trajectory has a maximum reach is roughly 8,500 km. This means Kim Jong Un’s nuclear bomb must weigh less than 350 kg if he expects to strike the western edges of the US mainland. A 600 kg payload barely reaches Seattle. North Korea appears to have taken another minor step forward as it attempts to mature its ICBM technology. Many more tests are needed to establish the missile’s performance and reliability, and it remains unclear if the North’s engineers have attempted to validate the efficacy of the missile’s re-entry vehicle. Though North Korea continues to progress, our assessments have not changed in that a viable ICBM capable of reaching the west coast of the US mainland still remains about a year away. The only “Sain-ni” of which we are aware is a variant name for Pyongsong, a scientific center north of Pyongyang, just east of the Pyongyang International Airport. A secondary runway of that airport was used in previous mobile-based ballistic missile launches earlier this year. According to the post-test announcement in the Korean Central News Agency (KCNA), the Hwasong-15 apogee hit 4,475 km, traveling a distance of 950 km. “Kim Jong Un Guides Test-fire of ICBM Hwasong-15,” Korean Central News Agency, November 29, 2017.